The most competitive ergonomic anti fatigue mat ever made. Today, Satech claims to be an anti-fatigue mat for people. The claim averages about 110 pounds per square inch. 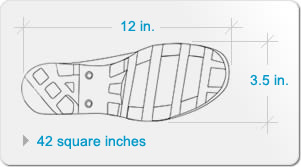 Imagine a person exerting 110 pounds per square inch - in an area of 42 square inches, per shoe. Any discussion about Compressibility without equal discussion about its inverse, Support, ignores the fact that one factor cannot exist without the other. Cushion and Support are reciprocal mechanical factors necessarily related to the performance of many ergonomic products including matting, insoles, shoes and even chairs. Read more. Barefoot. Give-in Early. Give-up Last. And be quick about it - for a long time. Most rubber mats sold in the US are imported. Barefoot is made in OHIO, USA. Most rubber mats are filled with clay and or sand. Barefoot is 100% free of fillers.